Racism in America: Extrajudicial Killing of 313 Black People in 2012, One Every 28 Hours! George Zimmerman has been found innocent of both second-degree murder and manslaughter for the killing of Trayvon Martin. In spite of Zimmerman’s history as a neighborhood watchman employing racial profiling; in spite of the fact that he was armed with a gun and Trayvon was not; in spite of the fact that he stalked Trayvon in a way that anyone would find threatening; in spite of his recorded menacing comments about “f…king punks,” that “these assholes always get away”; and in spite of his defiance of a 911 operator who told him he did not need to follow Trayvon, Zimmerman is free. On the other hand, Trayvon has been found guilty. In dropping all charges against Zimmerman, the jury concluded that Trayvon had thrown the first punch in response to Zimmerman’s threatening behavior, and therefore Zimmerman was justified in shooting him in self-defense. If only it could be said that a more perverse and twisted miscarriage of justice by our legal system was hard to find. Agonizingly, it is not. For millions of people this tragic affair was never simply about a confrontation between Zimmerman and Martin. It was the United States justice system that was on trial under charges of institutional racism — and it has proven itself guilty. These killings, without pretext or legal consequences, demonstrate that the stormy reactions following Trayvon’s murder and Zimmerman’s initial release without charges weren’t the result of an outrageous break from how the U.S. justice system operates. Rather, it was because the tragedy was yet another example of this system’s outrageous racist norm. During the initial wave of mass protests against Trayvon Martin’s murder in 2012, many chanted and carried signs saying, “I am Trayvon Martin.” For black participants this was more than an expression of solidarity. It was an acknowledgement of the racist reality that they too could easily meet a similar fate to Trayvon’s — that is, becoming a victim of state sanctioned murder. Authorities initially expected Zimmerman’s murder of Trayvon to disappear from the radar as he walked free. That is the normal script for how such incidents play out. However, the recording of Zimmerman’s 911 call was too dramatic for the press to let slip away. The tape and Zimmerman’s release without charge sparked a national wave of protests that included the peaceful shutdown of the Sanford Police Department for five hours. And the impact of the public’s reaction brought results. Sanford Police Chief Bill Lee was forced to resign. The Federal Justice Department’s Civil Rights Division opened an investigation to the killing. If it were not for the mass reaction, Zimmerman never would have been put on trial. With313 black people killed by police, some security guards, and self-appointed vigilantes in 2012 without legal consequence, the wave of protest following Trayvon’s killing is the main factor explaining why events here took a different turn. Those in power were forced to change their tactics in order to contain popular revolt. The importance of this cannot be overestimated despite the trial’s outcome. What the trial revealed is that the system of racial oppression in this country is not all-powerful. It can be challenged and ultimately overturned. It also revealed that what is required to move this process forward is a campaign of mass organizing — with a political perspective that demonstrates a clear path for judicial change if the grassroots can be mobilized to confront our oppressors. We need an ongoing mass civil rights movement with the power to pull out racism from the political and economic foundations of the U.S. by its roots. That power can only be built by unifying the vast majority against an economic elite which controls the political system and profits from blacks’ oppression. The mass protests that will erupt in response to Zimmerman’s acquittal can act as a springboard for such a movement, as long as participants understand the need to commit themselves to the long-haul struggle. 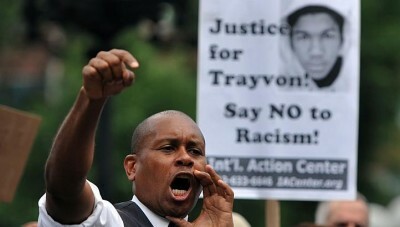 The NAACP is urging Attorney General Eric Holder to open up a civil rights case against Zimmerman. By itself, this is an impotent plea. However, combined with a sustained campaign of mass actions — not only for justice for Trayvon, but as a challenge to the racist norm of the U.S. legal system — this approach may bear fruit. The only certainty is that we cannot sit at home and let the courts work through their process. We must mobilize and organize to assert popular power independent of the courts and corporate Democrat and Republican parties if we are to create a world where Trayvon, and the millions he has come to represent, can thrive without fear. Mark Vorpahl is a union steward, social justice activist and a writer for Workers Action and Occupy.com. He can be reached at [email protected].